Printers and bibliographers use a bevy of terms to refer to works printed on one side (or sometimes both sides) of a single sheet. Smaller imprints are typically called fliers or handbills, and in most cases, are intended for distribution by being handed out directly to readers. Broadsides and broadsheets (the terms are sometimes used interchangeably) are somewhat larger and are often intended for posting in a public place, as are the still larger posters and billboards, which more often than their smaller equivalents feature graphics as the center of design. As rife as the terms are, the substrate for printing can be just as variable, ranging from paper to vellum and parchment, silk or other fabrics, to a variety of other media. All of these forms are considered “ephemera” in that they were historically intended to be printed, distributed, and discarded. Historically, broadsides and posters were most often printed using moveable type on a letterpress, though lithography or other technologies are not uncommon. Intended to catch the attention of passers-by, broadsides often feature a line or more of large text, and may be graced with typographical borders, woodcuts, or other illustrations. Historically, they were used to communicate focused information such as political proclamations, social messages, local events, or screeds of various types, and they became a primary tool for commercial advertisement. Some verge off into more or less purely artistic or literary expression. This growing collection contains a range of broadsides and posters that come from a variety of sources, and that are not part of other manuscript collections. The collection has been organized into four series to reflect its primary strengths: Communist and Post-Communist; Cultural, artistic, and literary broadsides; the lon-1960s; and political posters and broadsides. We expect that the collection will continue to grow. The series includes five brocade posters of Communist heroes printed at the East is Red Silk Weaving Factory in Hangzhou in 1969 or 1970. The posters include portraits of Mao Zedong (two sizes), Lenin, Stalin, Marx, and Engels. This series includes an eclectic, miscellaneous mix of broadsides and posters, including poetical broadsides, advertisements for an traveling daguerreotypist and bee hive maker, and local cultural events. Politics are an historical focal point for mass communication using broadsides, with intentions, depending on the political system, ranging from issuing decrees to encouraging obedient citizenry or soliciting support from the electorate. Many of the posters in this series relate to causes including reproductive rights, gay rights, antiwar activism, and opposition to U.S. intervention in Central America. 1 item : 40 x 28.5 cm. 4 poster : 79 x 50 cm. 1 item : 42 28.5 cm. Klidne vanoce s obcanskym forem. S.l. : s.n. 2 poster : 79 x 50 cm. 1 poster : 40 x 27 cm. 1 poster : 79 x 50 cm. 3 poster : 79 x 50 cm. 1 poster : 48.5 x 68.5 xm. Skromnoye obayaniye burzhuazii [Discreet charm of the bourgeoisie]. Moscow? Spisat’ povsemestno / yestroyki!. Moscow? 5 poster : 79 x 50 cm. 1 broadside ; 28 x 12.5 cm. Poetical broadside on death, containing 7 quatrains, with cut of urn at top and serpentine border along the sides decorated with row of skulls and crossbones at bottom and hourglasses at top; top of border broken by phrase ‘My glass is run.’ Not in Imprints, Wegelin, WorldCat. Free Spirits: The birth, life, and less of a New-Age dream. Northampton, Mass. : s.n. 1 broadside ; 31 x 26 cm. 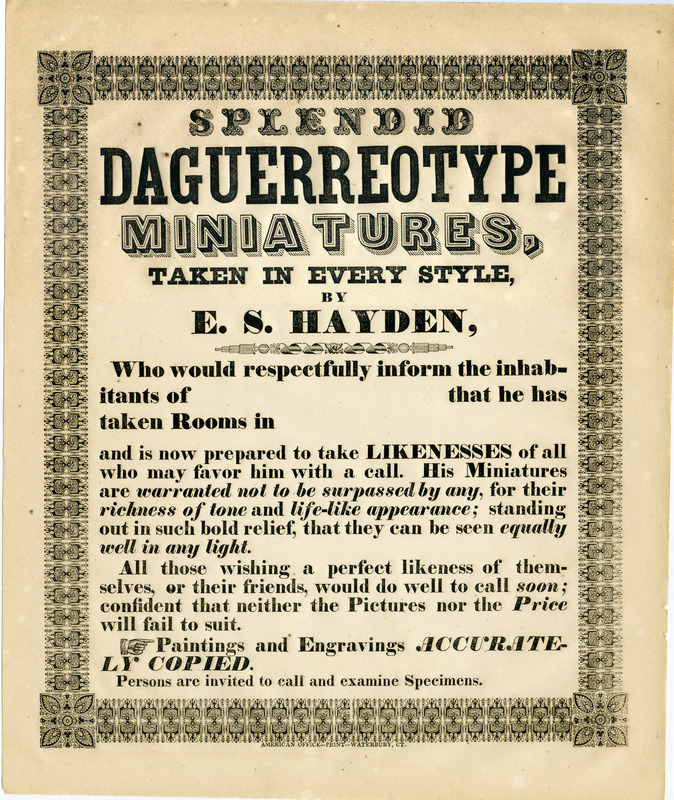 Broadside advertisement for Waterbury-based daguerreotypist printed with blanks, apparently for use as he worked as an itinerant in other towns. If a man does not keep pace with his companions, perha[ps it is because he hears a different drummer. . . Sister Mary Corita. . . Morris Gallery. New York : s.n. 1 poster : 51 x 35 cm. Kolb Brothers: America’s best entertainment with Kolb Brothers. Grand Canyon, Ariz. : s.n. 1 item : 28 x 21.5 cm. Releasing a dove. S.l. : s.n. 1 poster : 57.5 x 43 cm. Reynolds, O.: To farmers and others engaged in the culture of bees: Dr. O. Reynolds’ non-swarming and dividing bee-hives : the only ones of value now before the public, and now in use by over 2000 apiarians, in the state of New York. New York : s.n. 1 broadside ; 52.5 x 34 cm. Broadside with decorative typographical border and cuts of beehives. U2, the Unforgettable Fire tour. Hamburg, Germany : s.n. United States National Student Association: Fourth National Student Film Festival. New York : s.n. Universala Kongreso de Esperanto, Portland, Oregon. 1 broadside ; 20.5 x 17 cm. Broadside poem in to columns and 24 quatrains, with typographical line between, on death of six women and a boy by drowning. Evans no. 4874; Wegelin 820. Build solidarity of the Americans: Chile, Attica, Puerto Rico. Boston : s.n. 1 poster ; 43.5 x 27.5 cm. Committee to Defend the Panther 21: The Street Wall Journal: Why we strike, vol. 1, 1. New York : s.n. 1 poster : 22 x 17 in. Committee to Defend the Panther 21: The Street Wall Journal: Why we strike, vol. 1, 1 (variant on orange stock, without overlain image). New York : s.n. Committee to Defend the Panther 21: The Street Wall Journal: Why we strike, vol. 1, 2. New York : s.n. Committee to Defend the Panther 21: The Street Wall Journal: Why we strike, vol. 1, 3. New York : s.n. Indochina Peace Campaign: The US is still in Vietnam. . . Urge Congress to cut aid to Thieu. Martin Sostre Defence Committee: Wanted by the people — conspiracy, murder, extortion — Nelson Aldrich Rockefeller. Buffalo, N.Y. : s.n. National Campaign: Stop Rockefeller, the rich get richer, and the poor get hell. National Campaign to Impeach Nixon: March to impeach Nixon: Washington, Chicago, Los Angeles. .
1 item : 38 x 28 cm. Prairie Fire Organizing Committee: Black people have not. . . March against racism December 14. Boston : s.n. Solidarity with Indochina. Boston : s.n. 1 poster: 36 x 46 cm. 1 poster: 35.5 x 56 cm. 1 poster: 56 x 35.5 cm. Students for a Democratic Society: We are we burning, torturing, killing the people of Vietnam. . . To prevent free elections. What we want, what we believe: October 1966 Black Panther Party Platform and Program — Join the Nation Strike, New University Conference. S.l. : s.n. 1 poster : 43.5 x 28 cm. ACT UP San Francisco: Inflamed by flare-ups against queers and PWAs / Maybe it’s your governor. San Francisco : s.n. Bicentenario sin colonias, a luchar por nuestros derechos a filadelphia. Boston Committee in Solidarity with the People of El Salvador: National week of solidarity with the people of El Salvador. Coalition to Stop US Intervention in the Middle East: No blood for oil: stop the War in the Gulf. Boston : s.n. Committee to Defend Abortion Rights: Defend Dr. Edelin! Defend abortion rights!… Faneuil Hall, Thurs. Mar. 20. Boston : s.n. 1 poster : 42.5 x 27 cm. Poster protesting sentence of Ella Ellison, framed for two murders. A retrial was ordered for Ellison in 1978 and she was not retried. 1 poster : 28 x 21.5cm. IV Congreso Federal Ordinario de Feasies: en el camino hacia la paz, la justicia social, y la democracia / companero Jose Tomas Mazariego tu ejemplo de lucha presente!. Keller, Charles: Martyrdom of Julius and Ethel Rosenberg. Clifton, N.J. : Henwallt Co.
1 poster : 66 x 48.5 cm. National Abortion and Reproductive Rights Action League: We will decide, November 3rd. Out at work: can your employer fire you because o who you sleep with? The first film about Lesbians and gay men on the job. New York : s.n. Paul Robeson memorial concert at Peace Arch Park at the Washington State-British Columbia border, S.l. : SEIU Greenhouse Cultural Program. Sample ballot: Democratic ticket, Republican ticket, Prohibition ticket. Indiana : s.n. 1 ballot : 30 x 19.5 cm. Printed ballot for 12th District, Indiana, for election of 1898; James M. Robinson represented the 12th district in Indiana 1897-1905; this appears to be the election of 1898. Sparhawk, Barbara: Not my flag! (The legend of Tommy O’Toole). Altavista, Va. : Altavista Printing Co. Some of the items in this collection have been digitized and may be viewed online through SCUA’s digital repository, Credo. Cite as: Broadside and Poster Collection (RB 034). Special Collections and University Archives, University of Massachusetts Amherst Libraries.